Pomacom graduate student, Su�i� Mato, is going to defend his master thesis entitled "Control of mold status of bentonite mixture and the appearance of defects in castings of cast iron". Defense will be held at the Faculty of Mechanical Engineering in Zenica, on Friday, 16.7.2010, at 13:00 AM. Pomacom graduate student, Buljeta Ivica, is going to defend his master thesis entitled "Research of the causes of variations of shape and dimensions in continuously cast AlMgSi logs using computer simulations and measurements". Defense will be held at the Faculty of Mechanical Engineering in Zenica, on Friday, 16.7.2010, at 11:00 AM. Pomacom graduate student, Borislav Pajki�, is going to defend his master thesis entitled "Assessment of measurement uncertainty in the calibration of planparallel length gauges class 'K' in the interferometer 'NLRM-Tsugami' type GBK-250". Defense will be held at the Faculty of Mechanical Engineering in Zenica, on Friday, 9.7.2010, at 11:00 AM. Samir Leme� is going to defend his Ph.D thesis "Validation of numerical simulations by digital scanning of 3D sheet metal objects". The supervisor is prof.dr. Karl Kuzman. The thesis defense will be held at the Mechanical Engineering Faculty in Ljubljana, Slovenia, on Wednesday, 23.6.2010, at 10:00 AM. Pomacom graduate student, Josip Ka�mar�ik, is going to defend his master thesis entitled "Experimental and numerical determination of stress concentration factors for reinforced openings in pressure vessels". Defense will be held at the Faculty of Mechanical Engineering in Zenica, on Monday, 7.6.2010, at 11:00 AM. The new book is out of print: "Proizvodna mjerenja (Production measurements)". Authors: Nermina Zaimovi�-Uzunovi�, Samir Leme�, Daut Denjo and Almira Softi�, reviewers: Sabahudin Ekinovi� and Smail Klari�. The final round of information and consultations before adoption of ISO 26000 standard was held on November 17 and 18 for representatives of Central and Eastern Europe and Balkan countries. 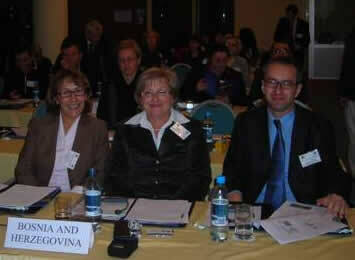 Bosnia and Herzegovina representatives were Prof.dr. Nermina Zaimovi�-Uzunovi�, president of B&H Quality Association, Mrs. Lenka Kozi�, manager of Market surveilance agency, and Tihomir An�eli�, expert of Bosnian Institute for standardization of Bosnia and Herzegovina. ISO/TMB/WG/SR comittee prepared standard which refers to social responsibility of all stakeholders in modern global economy. The following subject should participate in implementation of this standard, in February 2010: Industry (manufacturing and services), consumers, government sector, NGO, unions and others. The key objectives of this standard include: human rights, environment, labour rights, consumer protection, ethical business principles, involvement of local community in development. Standard is not subjected to certification, and numerous companies are being prepared to implement the principles of social responsibility in their business. All other stakeholders should be included into national mirror committee and to promote ISO 26000 in national level. The world quality day, November 12, this year was marked with the 4th Quality Conference entitled "National Quality Award". The conference was held in hotel "Europe", Sarajevo. Around 60 participants took part in conference activities. They came from industrial enterprises, governmental and non-governmental institutions, certification agencies and other companies who deal with quality assurance or who are interested to promote the idea of quality in their business. The materials and conclusions from the conference are available on the following link, and you can also see the Pholto galery from the conference. Between September 8 and 17 2009, the training for coordinate measuruing machine Zeiss Contura was realised in the Laboratory for measurements. The training was performed by mr. Robert Grosek from Zeiss IMT Austria. Intensive training was realised through 3 modules (Basic, Advanced i Curves) and it was attended by our laboratory staff, and cooperatives from the Institute for metallurgy "Kemal Kapetanovi�" and Mechanical Engineering Faculty from Sarajevo. After this training, the Laboratory will soon start with commercial services of dimensional and shape control. The meeting with key metrology experts was organized in Zenica, at the Institute for metallurgy and materials, on August 11. The meeting was part of the activities of the first part of the project "Establishment of national metrology system in Bosnia and Herzegovina". The meeting was intitated by mr. Du�an Kordik, team leader and expert for metrology from the Czech Republic and mr. Zoltan Zelenka, expert of Austrian metrology institute. EU supported and granted financial resources for the project "Strengthening metrology infrastructure in Bosnia and Herzegovina", with one million Euros. The project is granted to the consortium consisting of Austrian, Czech and Portuguese metrology institutes, who will help Bosnian experts to establish legal and fundamental metrology in B&H. The goal of this visit was to get familiar with status of metrology in B&H, preparation of report about this area and meeting the local experts who will participet in realization of this project. It is important to mention that establishment and functionality of metrology infrastructure in B&H one of EU integration preconditions. May 20th is International Metrology Day. University of Zenica marked this day through delivery of modern metrology equipment, including coordinate measuring machine. You can see the photo gallery about laboratory renewal. Representatives of EUA (Europan University Association) visited our Laboratory for measurements on Friday, 20.2.2009, as part of activities of external evaluation of UNZE. Pomacom graduate student, Borislav Bo�njak, is going to defend his master thesis entitled "Methods of testing declared characteristics of household appliances according to EU standards". Defense will be held at the Faculty of Mechanical Engineering in Zenica, on Friday, 27.2.2009, at 11:00 AM. First Pomacom graduate student, Ned�ad Hara�i�, is going to defend his master thesis entitled "Modern calibration method for XRF spectrometer by means of synthetic standards (etalons)". Defense will be held at the Faculty of Mechanical Engineering in Zenica, on Monday, 19.1.2009, at 11:00 AM. Chair members, Prof.dr. Nermina Zaimović-Uzunović and Samir Lemeš M.Sc., presented a paper "Importance of metrology education - B&H case" at the 1st International Symposium RMO 2008 - Regional Metrology Organizations "Metrology, Testing, and Accreditation – Breaking the Trading Barriers", between November 12 and 14 2008, in Cavtat, Croatia. At this page you can see some photos from the conference. Federal Ministry for education and science granted financial support for purchase of equipment for the Chair of automation and metrology of the University of Zenica. This grant was used to purchase and install 3D scanner Nextengine, and graphical workstation IBM Intellistation M Pro. University of Zenica applied this project for EU Tempus SCM programme (Structural and Complementary Measures) in December 2005. Prof.dr. Nermina Zaimovi� Uzunovi� from the University of Zenica is project coordinator, University Erlangen-N�rnberg, Germany is project grantholder, University of Maribor, Slovenia and Zenica-Doboj Canton are project partners. The project was accepted by European Comission as project number C004A06-2006, and it will be realised between 15.10.2006 and 15.10.2007. 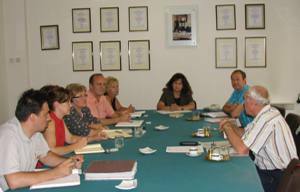 Chair members take part in project "Course Development Program Plus" financed by WUS Austria. In winter semester 2006/2007 the following courses are updated: "Metrology" at the Faculty of Mechanical Engineering, coordinator prof.dr. Nermina Zaimovi�-Uzunovi� and two courses set at the Pedagogical Faculty (Applicative software, Programming for Internet), coordinator mr. Samir Leme�. In summer semester dr. Aleksandar Kara� will realise course "Procedural programming".